It's not that it's the best cookie recipe in the world. Nor was it created by my great-grandmother or filled with secret ingredients. I searched online a few years ago for an updated sour cream cutout cookie recipe and found plenty. That said, there are a few things about my recipe worth noting: (1) The cookie itself isn't too sweet, which balances nicely with the frosting; (2) if baked properly, the cookie stays soft and flaky; (3) the cinnamon, nutmeg, and lemon extract flavorings give it a subtle, festive, and rather unique flavor. My kids have come to love Cookie Day as much as I did as a kid. Today, Mia did her best to decorate hers like mine. Will tried to stay in step with his father by creating the goofiest cookies -- or at least by joking about a cookie while he frosted it. And Max spent at least 20 minutes on each of his cookies, creating masterpieces that only he'll eat. I think this is the first day that Tom and I didn't end up frosting the majority of the tray. 3. Refrigerate dough for at least an hour. Roll out on a floured surface and shape with cookie cutters, adding flour as needed. 4. Bake cookies at 375 degrees until the edges start to brown. 5. Cool, frost, and decorate. Confession: I broke rank one year and tried a more traditional sugar cookie recipe, but it didn't really work for me -- you just can't mess with tradition. I didn't admit this to my mom or sisters though. Until now. 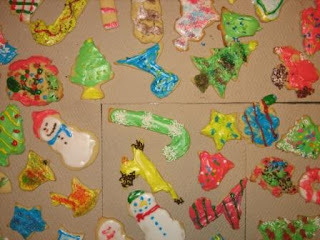 I used to love decorating Xmas cookies but my kids are still a bit young - I think we'll try next year. How do you make the frosting? My mom always used boxes of Jiffy frosting mix and food coloring. I can't find that, so I default to cans of vanilla or cream cheese frosting. This year, I also mixed up some Royal Icing, but the kids didn't prefer it. I CAN'T BELIEVE YOU SHARED IT! Isn't that our little family secret! Cookie day is always fun around here. Remember the year we doubled the batch? I think we frosted for 8 hours!